Did you know that the average healthy 2-year-old has never visited a pediatric dentist? In fact, only 25 percent of children have seen a dentist by the age of 5. Since tooth decay is the most common chronic childhood disease in the nation, children must see a pediatric dentist from an early age to help them avoid dental decay. According to pediatric dental experts, a child should have his first dental visit as soon as his first tooth erupts or no later than his first birthday. The child’s pediatrician can refer you to a pediatric dentist. During this first dental exam, the pediatric dentist will examine the child’s mouth, look for problems with their dental development and provide information about regular dental maintenance and protecting against tooth decay. A baby’s regular and long-term exposure to sugary formula, milk or juice in their baby bottles and sippy cups can result in a problem called baby bottle tooth decay. When teeth are submerged in these sugars, it promotes the development of tooth decay. If left untreated, baby bottle tooth decay can lead to major pain, dental infection and severe decay that could require tooth extraction. Yet by reducing a baby’s exposure to sugary liquids and gently wiping their teeth and gums a few times a day, you can significantly decrease the development of this disease. • Try to wean the child off of the bottle or breast by age 1. • Do not let children use baby bottles or sippy cups throughout the day and limit them to only meals and snack times. • Encourage children to drink sugary beverages through a straw to reduce contact with teeth. • Wipe a baby’s gums with a damp cloth after every feeding, when they wake and at bedtime. 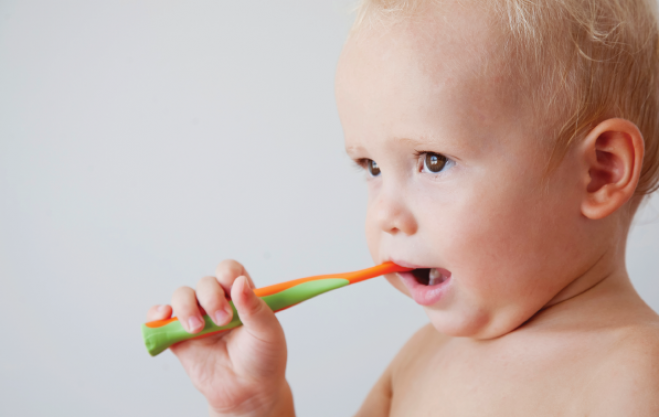 • Start brushing the child’s teeth with a soft-bristled brush and water as soon as their first tooth emerges. • Follow the care and cleaning advice of the pediatric dentist to preserve the child’s dental health. Early visits are essential to good dental health.